Sorry, This CC Bistro & Catering Location Has Been Reported Closed. 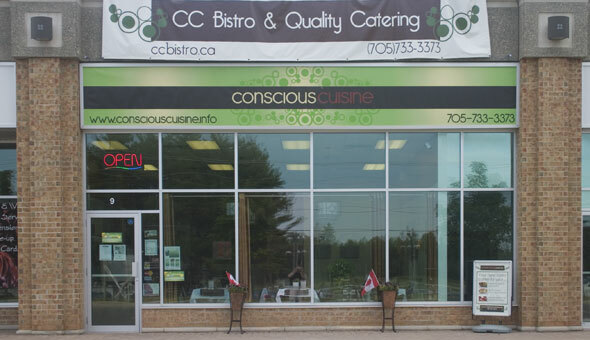 CC Bistro & Catering is a restaurant at 610 Huronia Rd., Unit 9 in the plaza just south of the intersection of Mapleview Dr. and Huronia Rd. in south Barrie. They Have a Passion for Creating Flavour Sensations & Express that with their Ever-Changing Menu + Chef's Specials. Their Tweaked Fresh Recipes are designed to Make each bite a Memorable Occasion. They Offer a Cozy Bistro Atmosphere, Good Food + Good Drink! Always Vegetarian & Gluten Free Choices. Many In House Made Desserts to choose from. They also bring the same Expertise to Catered Events & Business Gatherings & Provide an extensive, Bake to Order Service which includes Traditional Birthday Cakes, Fancy Cupcakes & Many Gluten Free choices as well.